It is such good news for EALT, when we hear that others are inspired by our work, educational projects, or conservation initiatives. And this is just what has happened via St. Albert’s 2nd Scouts. Last year, EALT was interviewed on Global TV’s Weekend Morning Show, featuring our Protecting Pollinators project. We brought along our various Bee Hotels, discussing Alberta’s native bees, the benefits of Bee Hotels, our workshops and educational materials. This inspired a leader of the 2nd St. Albert Scouts to propose a Bee House project for 2017’s Good Turn Week. Good Turn Week is meant to encourage youth to give back to the communities in which they live, since even the smallest of "good turn" acts has the power to help shape and change the world in a significant way. The Scouts first designed and constructed hundreds of bee hotels, and Beavers presented one to each of their City Councillors. 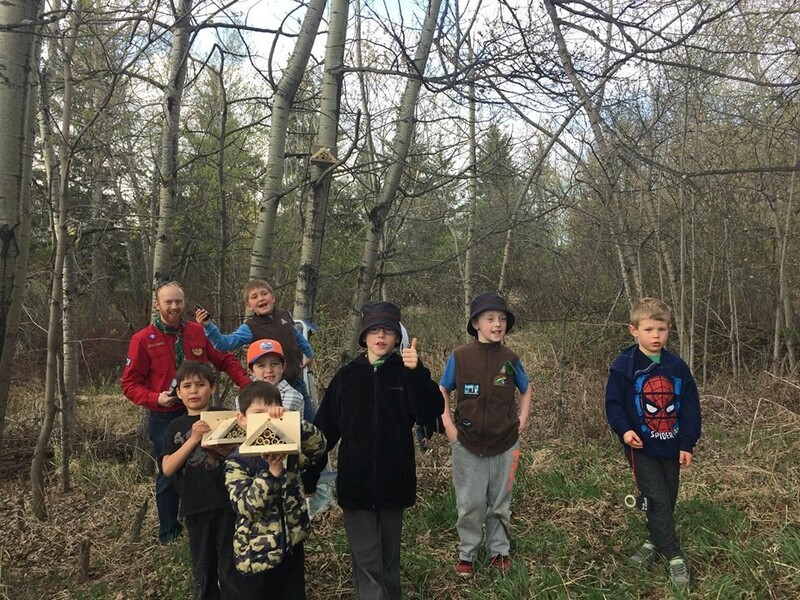 With funding from Scouts Canada and RBC Foundation, they hosted a launch day at the St. Albert Botanic Park, where they were to install a number of the bee houses. 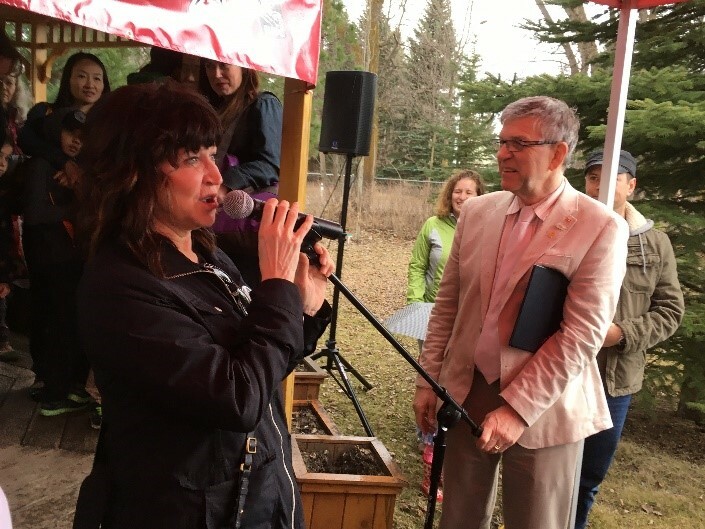 Along with MLA Marie Renaud, Mayor Nolan Crouse, Scout Commissioner Trevor Lema, and a volunteer from the Botanic Garden, EALT’s ED Pam Wight was invited to speak at this celebration, and to provide further information for participants and families. Although it was a windy day, there was no problem, since Scouts are a famously helpful group, and they soon erected a tent, table, and provided a couple of helpers at this impromptu booth. Thank you Beavers, Cubs and Scouts! The weather took a gloomy turn just as the ceremony was about to begin. Again, not a problem for this incredibly positive group and their families and guests. Another tent was erected just in front of the gazebo, and attendees crowded into the gazebo and tent just as the rain started, their spirits not the least bit drenched by the downpour! EALT is tremendously fortunate in being a finalist for the 2017 Alberta Emerald Foundation Awards, for our Protecting Pollinators through Community Collaboration project, which ran in 2015 and 2016. Our project was tremendously successful, judging from the numbers of workshops, participants, requests for bee hotels in public places, and educational materials produced – and it continues to soar! As we said, when interviewed by the Emerald Team, “it’s our hope that we can lead by example, and that others can pick up our ideas and lead their own initiatives.” The 2nd St. Albert Scouts have taken up this initiative in a really well-planned way, with all 5 of their scout sections working as a team to design, construct and place bee houses around St. Albert and Edmonton. A selection of photos from their Facebook page contributors follows, showing some of their bee houses and participants. 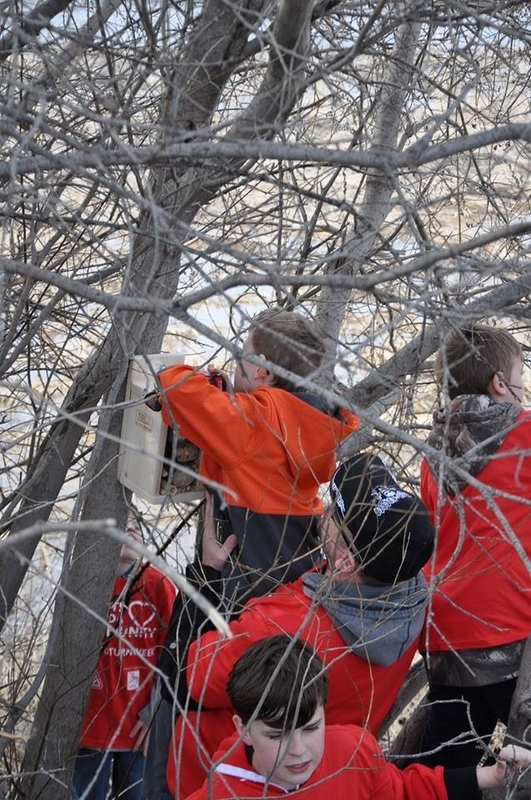 Beavers hung up 19 bee houses around Lacombe Lake Park – busy Beavers! It has been tremendously rewarding to see the Scouts involving members of all ages and adopting this project for Good Turn week – and beyond. As one young Scouts Canada spokesperson said in an interview with the St. Albert Gazette: “We can’t just save the honeybees; we gotta save the other kind of bees too. We’re Scouts, right? We’ve got to be super into nature. We’ve got to help our environment”. The Edmonton and Area Land Trust echoes these sentiments, and congratulates all of the 2nd St. Albert Scouts!